Bukit Bintang is one of the main shopping and trendy districts of Kuala Lumpur. With a wide selection of hotels, endless shopping opportunities, and markets, the area attracts many locals and quite a few tourists as well. Parallel to Jalan Bukit Bintang, the street that houses many fancy shopping malls and designers boutiques, is Jalan Alor. This street, which is almost a world of difference from the next street over, is one of the most famous streets in the city for Chinese Malaysian food. During the day the street can be a little quiet, and while even though some of the restaurants are open, there's not much outside seating. However, at night is when the street comes alive and round tables are wheeled onto the road accompanied by those all familiar plastic chairs. 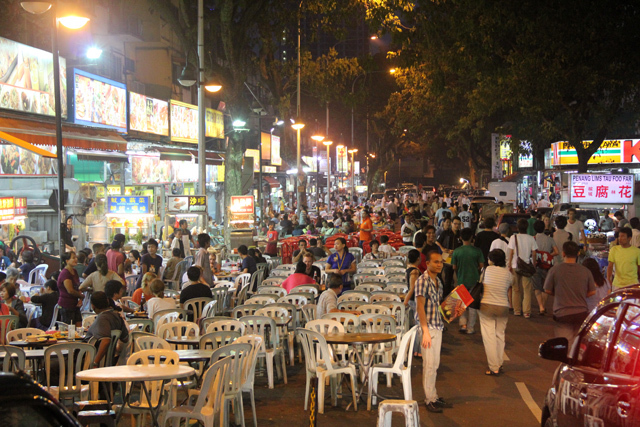 Both sit down restaurants and small street stalls line the road. Most of the culinary options are of the Chinese Malaysian variety; you'll find Chinese food, satays, fresh durian, and those famous Jalan Alor chicken wings. The last time I went to Kuala Lumpur, I consulted my Facebook friends on where to eat, and I was recommended to eat at Wong Ah Wah restaurant along Jalan Alor. 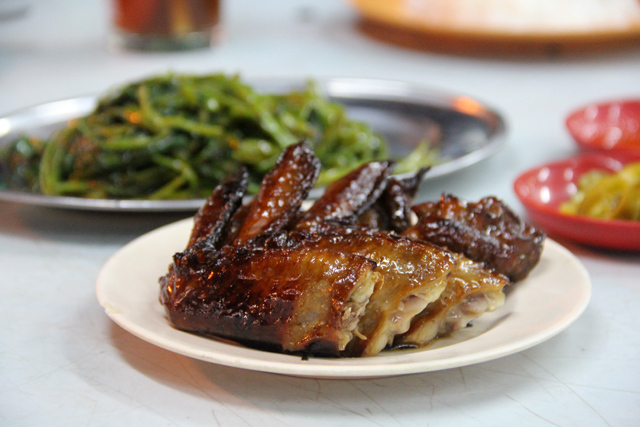 While some of the restaurants along Jalan Alor have seemingly started to cater more towards Western tourists, Wong Ah Wah is still a famous local restaurant. It is well known that Wong Ah Wah is where many Malaysian chefs that cook at nearby luxury hotels come to eat, drink, and relax after their night shifts – so it's that kind of a restaurant – good comforting food with a simple relaxing environment. We started our meal with the chicken wings, a dish no one who eats there misses; their chicken wings are famous! There's an entire specialized chicken wing roaster outside the restaurant and you can smell the wings along the entire street. They were really good, sort of a sweet honey soy sauce barbecue glaze on them. I do wish the chicken skin had been a little crispier though. 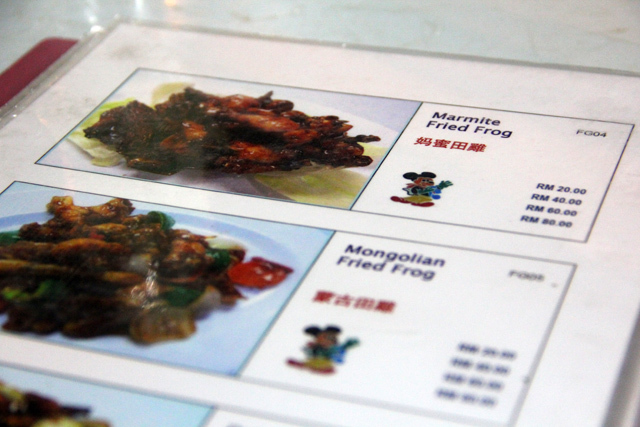 Seeing Marmite frog on the menu, I just couldn't resist the temptation to sample something so unique. At that time I didn't know Marmite was such a popular ingredient used in sauces at Chinese Malaysian restaurants, but I soon found it elsewhere as well. This was the real deal, a superb dish that was salty, sweet, and the frog legs were succulent and juicy. I had had Marmite a number of times on bread, but somehow the sauce, which was also mixed with soy sauce and other ingredients, created the perfect salty glaze for the legs. 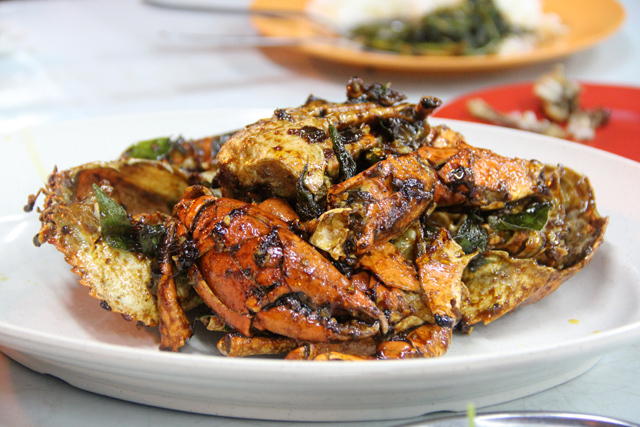 While the Marmite frog was a wonderful and unique dish, nothing compared to the crab. This beauty was cooked and stir fried in a sweet chili soy sauce along with a generous amount of freshly ground black pepper. The claws were packed with sweet buttery flesh and the preparation was outstanding. 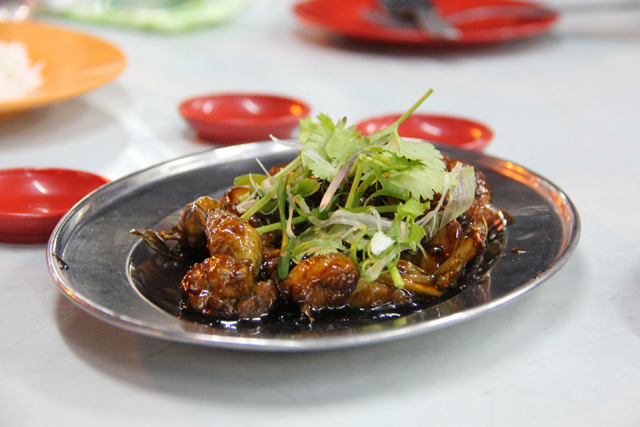 When you're in Kuala Lumpur be sure to stop at Jalan Alor and eat a delicious meal at Wong Ah Wah. Also, just a few kilometers down the road is another legendary food street known as Pudu Wai Sek Kai. On both streets you're sure to find something tasty! This post makes my mouth water! Thanks for sharing your insights. I’ve heard Jackie Chan was here for their chicken wings before. That chicken wings taste really good. Definitely worth it.